Ive only seen two CD's of thier work from the 78rpm era, and they wernt very good. I have quite a few more from the Fab three! If you just want to hear one version or you have limited bandwidth here are the mp3 versions that are not "zipped" up. Mp3 Direct Links Via Rapidshare.. The Three Suns - March Of The Cards MP3 "Good"
The Three Suns - March Of The Cards MP3 "Too Much Noise Reduction"
The Three Suns - March Of The Cards MP3 "Fake Stereo"
As per usual, with rapid share you may have to wait up to 60 seconds before you can download the song with a Free acoount. Thanks for this track! It's pretty easy to find a lot of the Suns' late 50's and 60's LPs online, but much rarer to find this earlier material. Thanks so much for sharing! 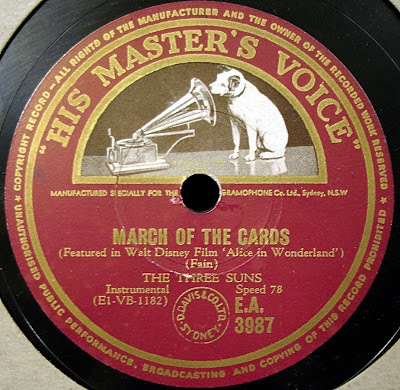 Would love to hear more Three Suns 78s if you get around to it. The Three Suns theme song was "Twilight Time" which they wrote themselves as an instrumental and Buck Ram added the lyrics.